When choosing Kaas Crew Services you can be assured of competence. Your demand for quality becomes ours. A capable team is part of your organizations most important asset. You can be assured that our personnel possess the proper qualifications and experience. In addition we can provide training and further education courses as required. Our commitment to quality is also demonstrated by our up-to-date knowledge of (international) maritime legislation. 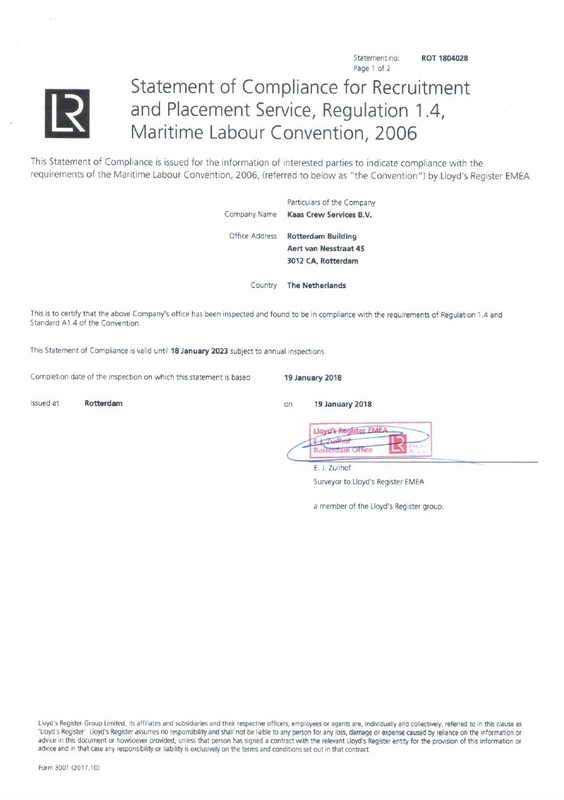 Kaas Crew Services is certified by Lloyds Register for MLC. Strict and transparent procedures are standard guarantee on the highest levels of quality and safety worldwide. Offshore, onshore, seven days a week, 24 hours a day.